SEASIDE PARK, New Jersey (WABC) -- A powerful explosion shook homes in Seaside Park just after 9:30 Saturday morning, eerily close to the mapped out route of the 'Semper Five' race, an annual 5K charity race honoring the U.S. Marines and Sailors. The person who is behind this seemingly targeted attack remains a mystery. 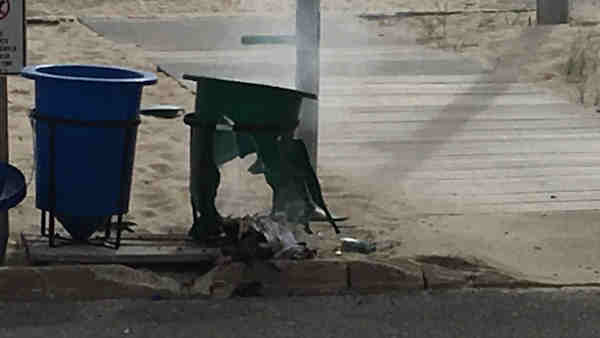 Local and state police along with the FBI and ATF quickly flooded the quiet beach town as bomb experts carefully removed and dissected what appeared to be three pipes intricately wrapped together inside a garbage can near D St. and Ocean Ave. Only the pipe detonated, and luckily no one nearby was hurt. A four-block area near the explosion was evacuated around scene. Roads were reopening closer to the scene around 1:30 p.m, but the beach was still off limits. The race was canceled. Officials said participants in the run had been scheduled to pass by the area around the time the blast occurred, but start of the race was delayed after an unattended backpack was found in the area. Al Della Fave of the Ocean County Prosecutor's office told ABC News that the device was too sophisticated to be a trick. "We don't know what this individual's agenda is." "Trying to see how sophisticated a device was in terms of the timing elements and everything else, that will be determined by the state police, the FBI and ATF," added Della Fave. Bomb sniffing dogs and helicopters scanned the neighborhoods for hours as dozens of families in a four-block radius were evacuated and helpless. "In today's age, I think we're past the point of whether it's a prank or not. I think every situation needs to be taken as seriously as possible," said David Martinez. Suzanne Miller says she passed by the very same garbage can less than fifteen minutes before the explosion. "This morning I happened to have been at that garbage can, and I actually threw the PopTart wrapper in the very garbage can that did blow up," says Miller. With an estimated 3,000 people participating in this year's race, many say it's a miracle no one was hurt. At this point, investigators are not saying whether this was just a criminal act or a terrorist act. All families are being allowed back into their homes, and they do not believe people in and around the area are currently in any danger.